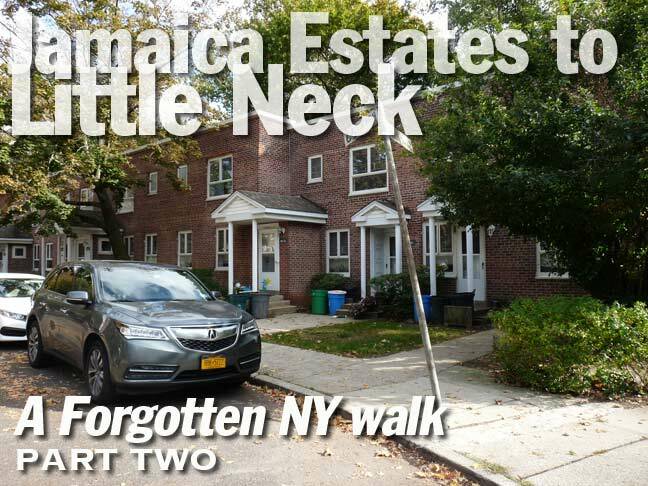 Today my idea was to walk from Jamaica Estates, one of two ritzy (or mostly ritzy, in comparison to where I’ve lived) areas in northern Jamaica, all the way home to Little Neck. When I was bicycling all over Queens between about 1993 and 2007 (I have recently gotten back into bicycling) I passed through Jamaica Estates a few times, and its partner neighborhood to the east, Holliswood, a very few times: I saw little of Jamaica Estates because I found it relatively uninteresting: I was seeking grittier fare as far as explorations went at the time, and I rarely went into Holliswood because it’s unmercifully hilly. 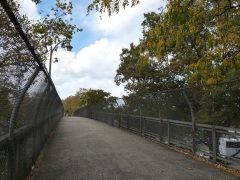 Since I do most urban exploring on foot these days, I no longer have to be really concerned about not being able to tackle steep hills on a bike, which I couldn’t do even when much younger. 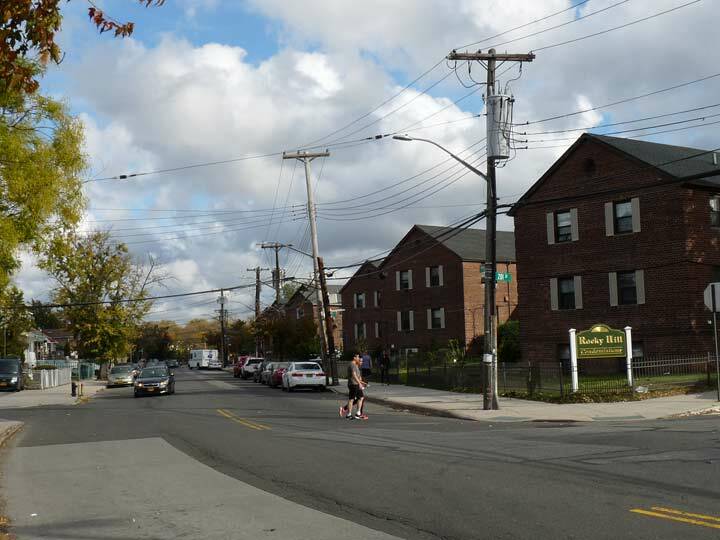 Thus, Jamaica Hills and Holliswood are more attainable for me on foot than they ever were when I was on a bike! As you can see from my map I did not follow a route “as the crow flies” but one that I knew would be more interesting based on previous trips. That’s usually my method, in any case. I lived very near Fresh Meadows between 1993 and 2007, and passed by and through it on my bicycle on many occasions. I think I covered it quite adequately and prolifically, even, on this FNY page from 2006. Yet, hopefully, there’s an aspect here and there I haven’t touched on yet as I pass through on this lengthy walk, and some new things to point out. This map of central Queens was scanned from a larger one produced by Hammond around 1910. It would be years before the prevailing street grid was laid out, and while some sections of what was then the southeast town of Flushing were already well-populated, some areas remained fields and farms until after World War II. 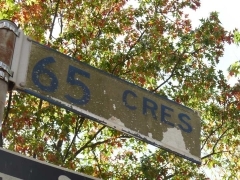 Yet, most of today’s main roads were already in place, as I have helpfully labeled here. 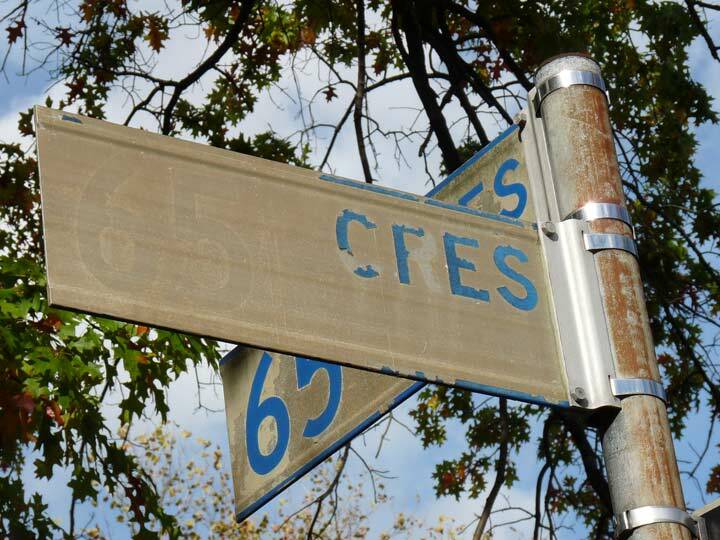 Heading north on 188th Street (a.k.a. Saul Weprin Street) into the heart of Fresh Meadows. 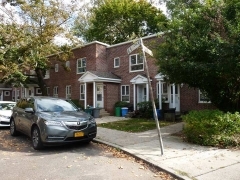 It’s known best for the eponymously-named extensive residential community centered at 188th Street and the Long Island Expressway that was constructed there between 1946 and 1949 by the New York Life Insurance company. 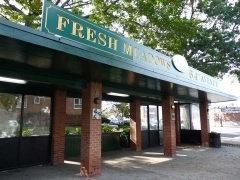 Prior to the apartment complex, the area’s claim to fame was Fresh Meadows County Club and golf course that hosted the U.S. Open in 1932. The housing mix is 3-story apartment buildings in garden settings, with a couple of high-rise towers. 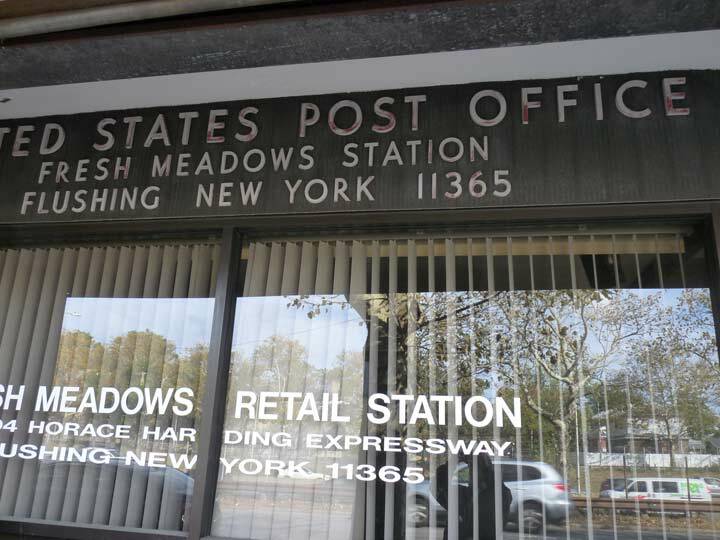 Fresh Meadows History has some vintage photos from the 1940s and 50s. 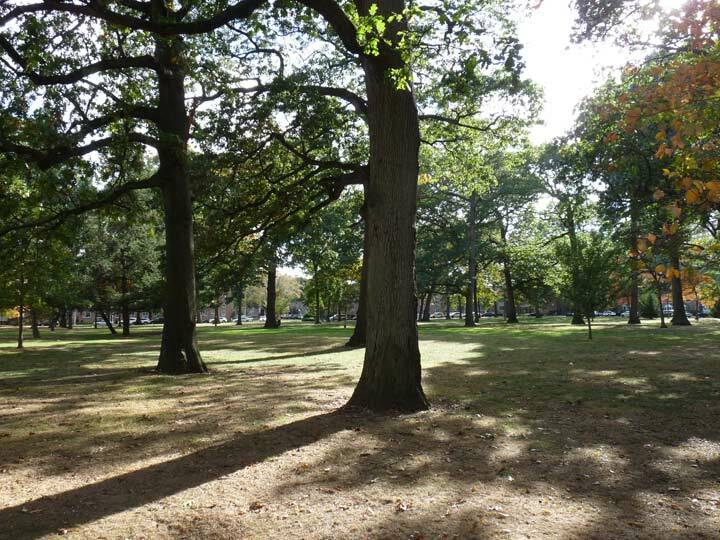 Fresh Meadows takes its name from its contrast to neighboring Flushing, whose name is a transliteration of the Dutch “Vlissingen” meaning “salt meadow valley.” Ponds and creeks running through the neighboring area to the southeast were likely “fresher” or free of salt, and so Fresh Meadows replaced the harsher-sounding older name for the region, Black Stump, which apparently referred to burned, blackened stumps that marked the edges of farms. 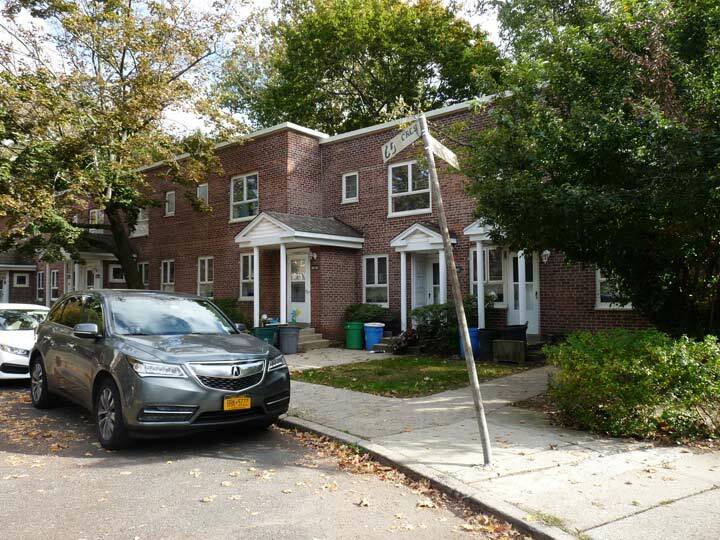 Until about 2000, one of Queens’ last remaining farms, belonging to the Klein family, sold produce on a roadside stand at 73rd Avenue and 199th Street. 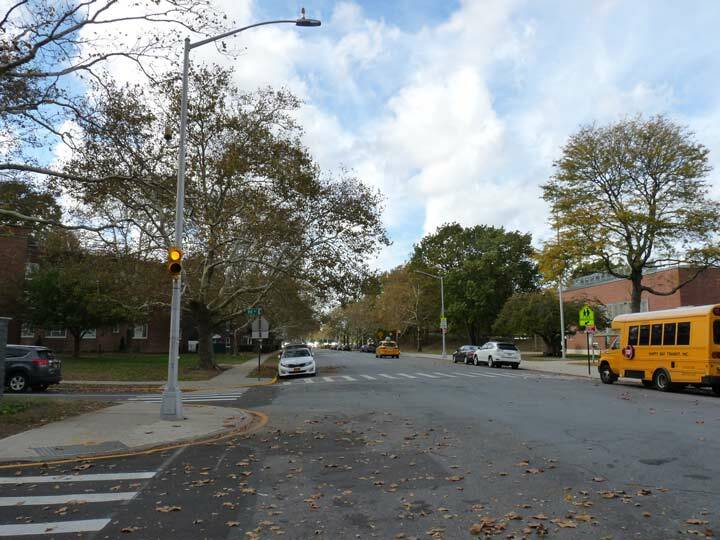 188th Street features two traffic circles, at 64th and 69th Avenues, and each has a relatively new protected bus shelter. The Fresh Meadows houses have their own street layout, street lighting and, in some cases, new street signs. 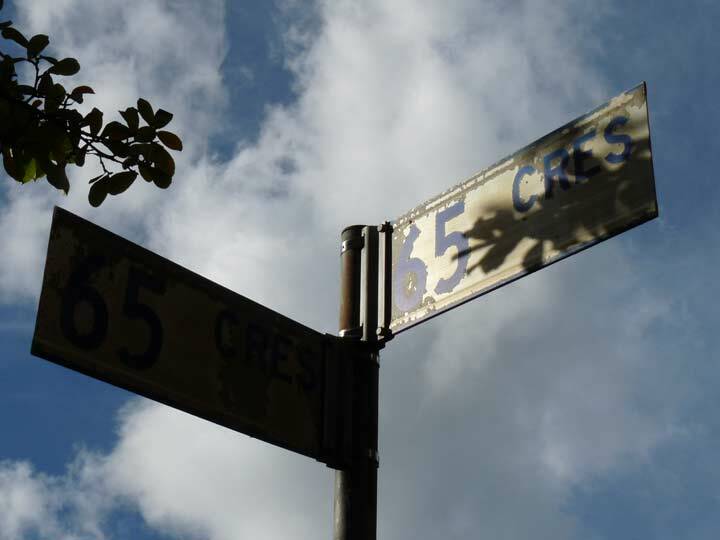 The street layout is so maze-like that the mythical founder of Athens, Theseus, would need the ball of thread he used to find his way out. However there is no Minotaur lurking within, I don’t think. 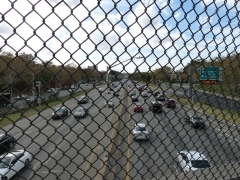 So complicated is the Fresh Meadows layout that 188th Street intersects with 186th Lane, which is marked by new signage, no fewer than three times, and the grounds have Circles, Crescents and lanes that weirdly conform to the Queens street numbering system, but strangely subvert it, as if a virus had infected it. 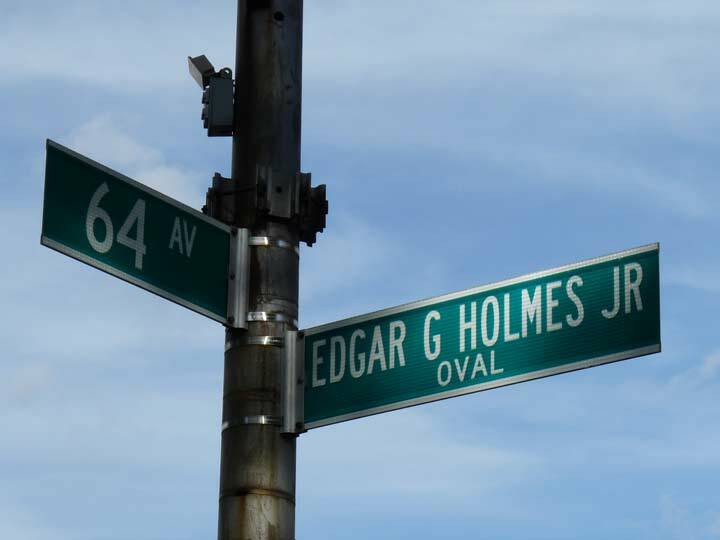 The 188th Street traffic circle at 64th Avenue is named for Edgar G. Holmes, the first New Yorker (in NY State) killed in the Korean War on July 9th, 1950; he was 18 years old. 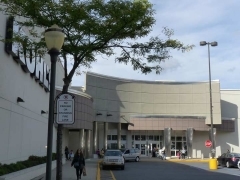 Fresh Meadows features a shopping mall anchored by Kohl’s and Dress Barn, and is known, rather unimaginatively, as the Fresh Meadows Shopping Center. 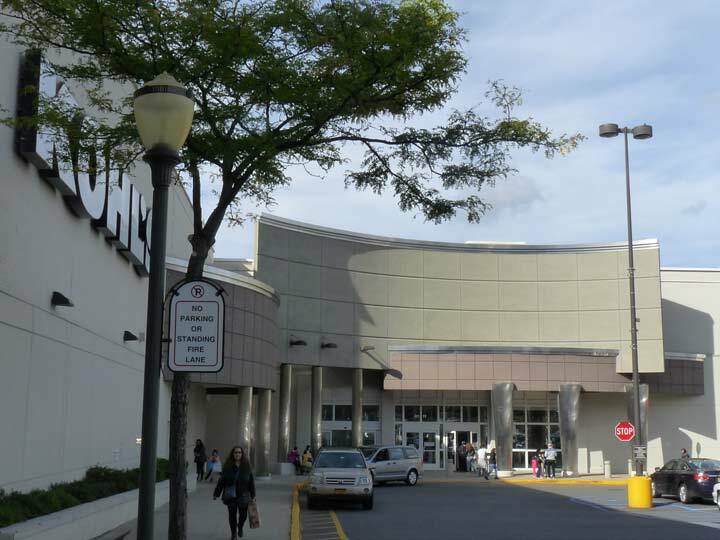 Kohl’s presents a blank white face to traffic on the adjacent Horace Harding (Long Island) Expressway and 188th Street; its main entrance faces the interior parking lot. 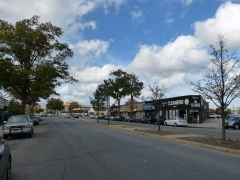 Fresh Meadows became the location of Queens’ first Hooters in the early 2000s. For those unaware, Hooters is a chain of sports bars featuring a wings and bar food menu, with waitresses in tight T-shirts and orange short shorts. Strangely enough my only experience with Hooters was in January 1993, when I was in Minneapolis at the Mall of America and we found it open late at night after a long flight. My friend Vinny L. and I flew out to Minny to take in a couple of Minnesota North Stars games (remember them?) and I had my one and only experience with minus ten F. temperatures. 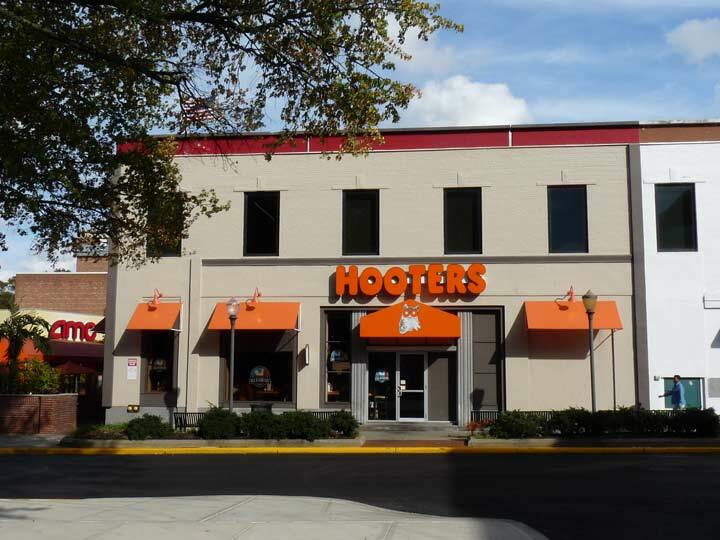 This Hooters location was formerly the Future Diner, which was visited by Bill Clinton during his successful 1992 presidential campaign, returning for a visit the following year as President. 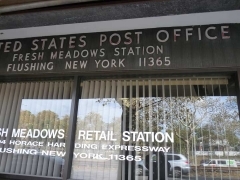 I was perplexed, initially, by finding the Fresh Meadows post office at Horace Harding adjacent to the mall closed on a Saturday. However, this is the shuttered location; the “new” post office is next door on the ground floor of the Boulevard apartment complex. 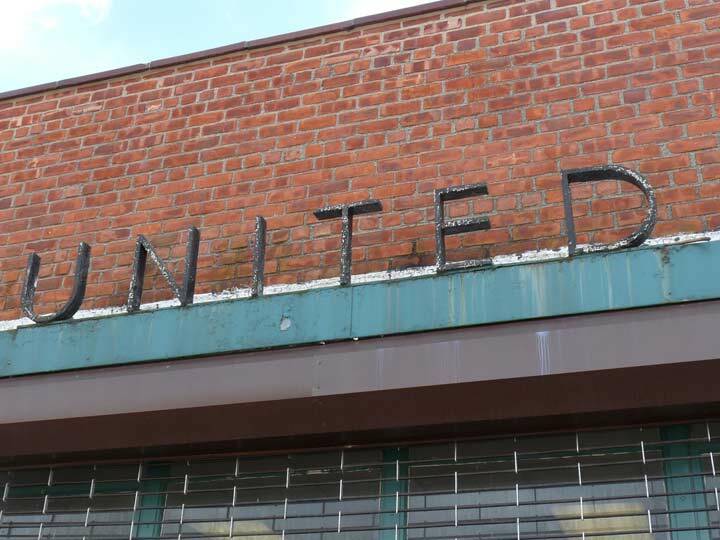 However, the now-rusted letters of the old PO, which likely date to the 1950s, are still marvelously in their original spot. The Fresh Meadows Queens Public Library location is listed as having been in this location since 1958. 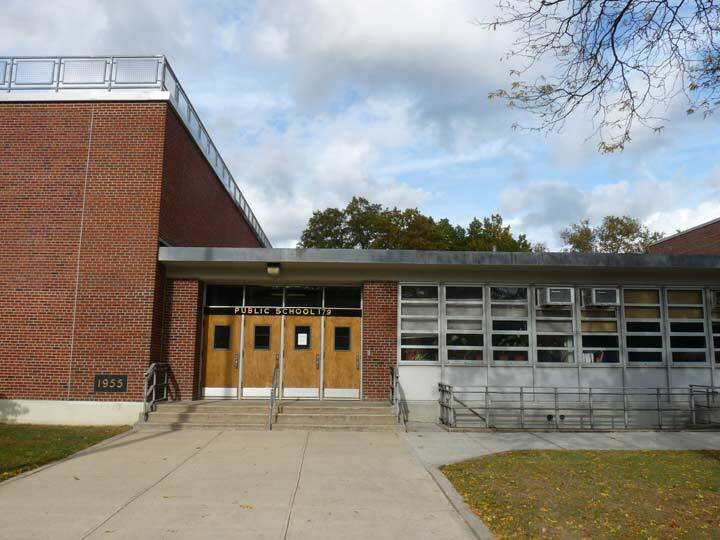 This building looks to be more recent than that year, with a streamlined, metal and glass design that looks as if it’s from the 1970s or 1980s. Set me straight in Comments if I’m wrong. 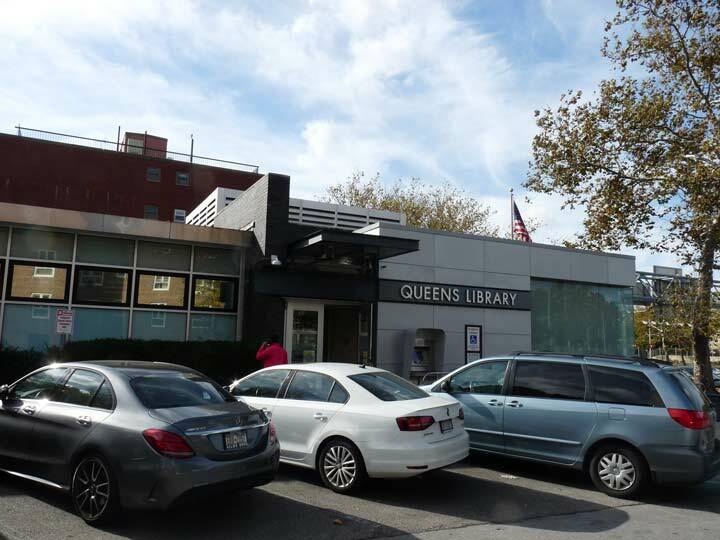 It’s one of 62 branch locations of the Queens Library, which has operated as an entity since 1858. I noticed this unusual building across the LIE. 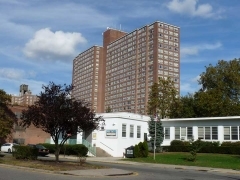 It’s the Fresh Meadows Jewish Center at Peck Avenue and the north service road. 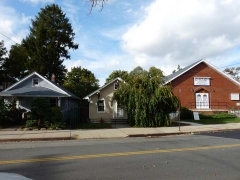 The synagogue’s lengthy online history dates the building to 1966. The name “64th Circle” implies that this is the 64th in a series of Queens Circles, but this is only a consequence of Fresh Meadows’ quirky and nearly unnavigable street layout. 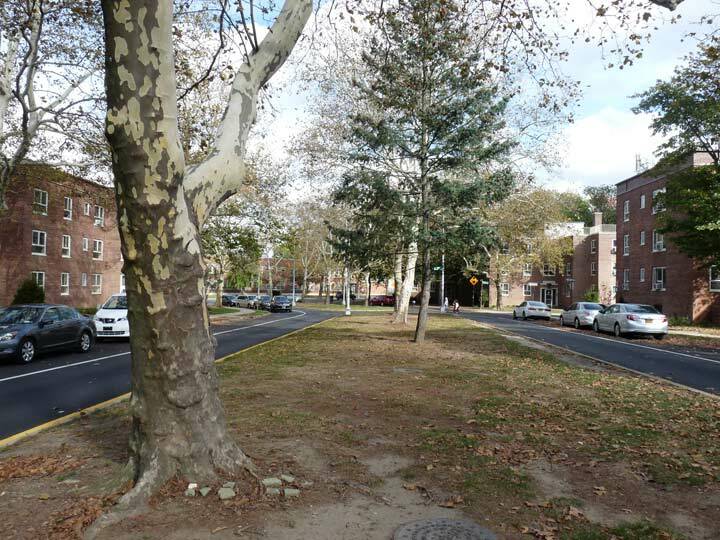 It encircles a true green, not a park. 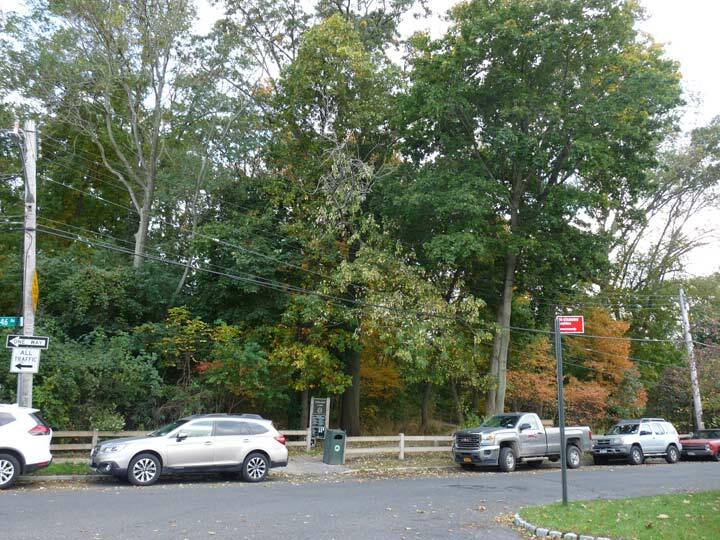 A similar “green” can be found in the much ritzier Forest Hills Gardens a few miles to the west. 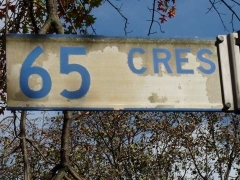 I was met with a quinella of interesting infrastructure at the unlikely corner of 64th Avenue and 64th Circle, where there’s an olive mail relay box, a rectangular fire alarm from the 1950s, a regulation stop sign and most notably, a concrete post that long ago supported a small, slotted public mailbox. 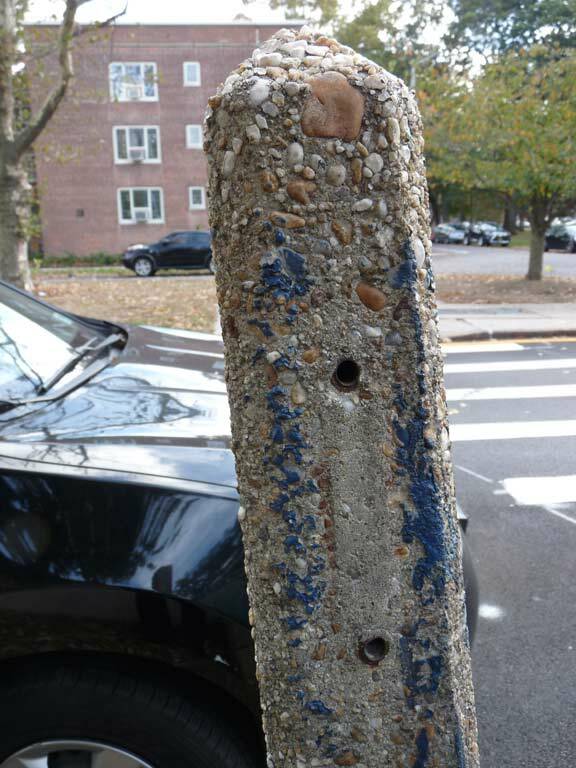 The holes in the post from where the box was bolted to it are still in place. 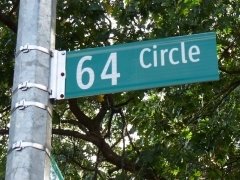 64th Avenue is fully malled between 64th Circle and Peck Avenue. 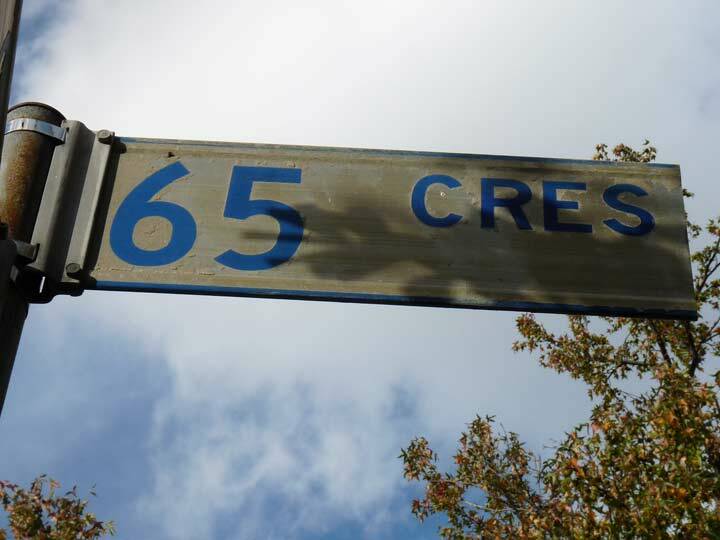 This is an unusual 10-photo Gallery, but I wanted to capture the four remaining blue-on-white Queens street signs here on the corner of 65th Crescent and 65th Crescent (there’s a bend in the road). 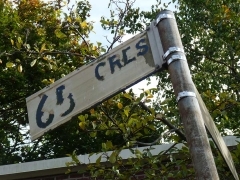 These type of signs were standard issue in Queens between 1964 and about 1984, at which time they were replaced by today’s white on green design. 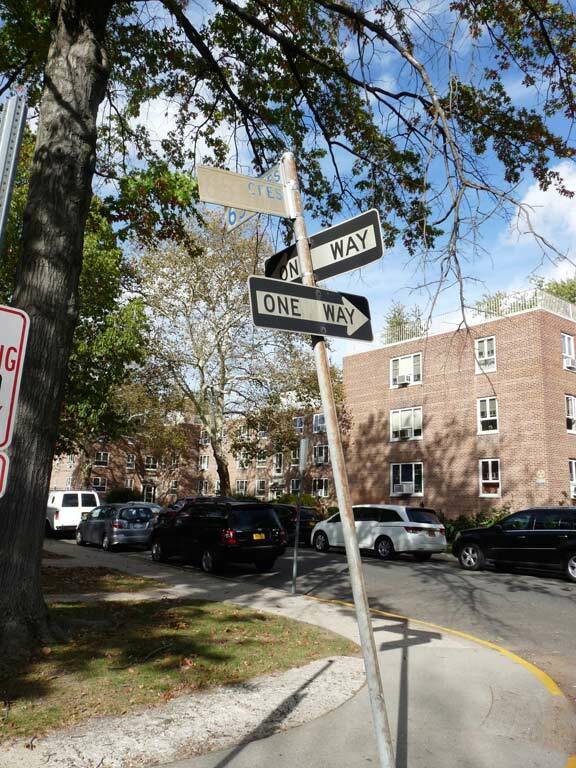 When I began FNY in 1998, there were still a few dozen of the white signs around, but they’ve all been weeded out by the Department of Transportation…except for these four signs, on two separate poles. 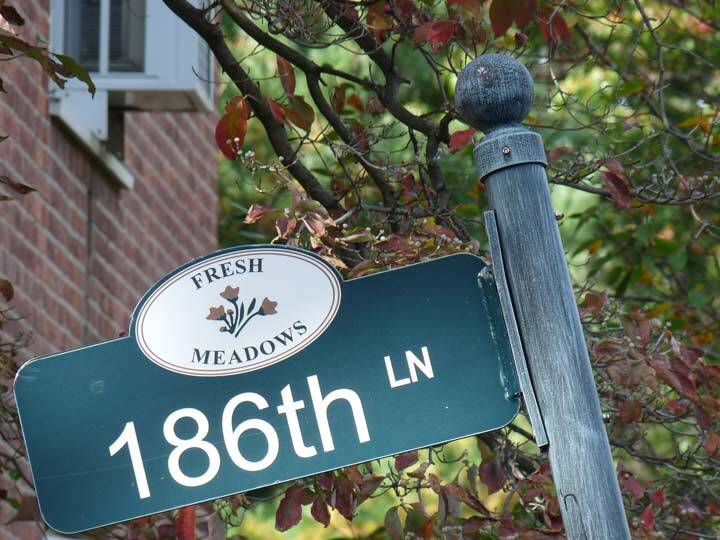 Fresh Meadows is a semi-private development, which may explain these signs’ longevity, but there are new signs elsewhere in the complex. I’ve shown these signs before…am I dooming them now? 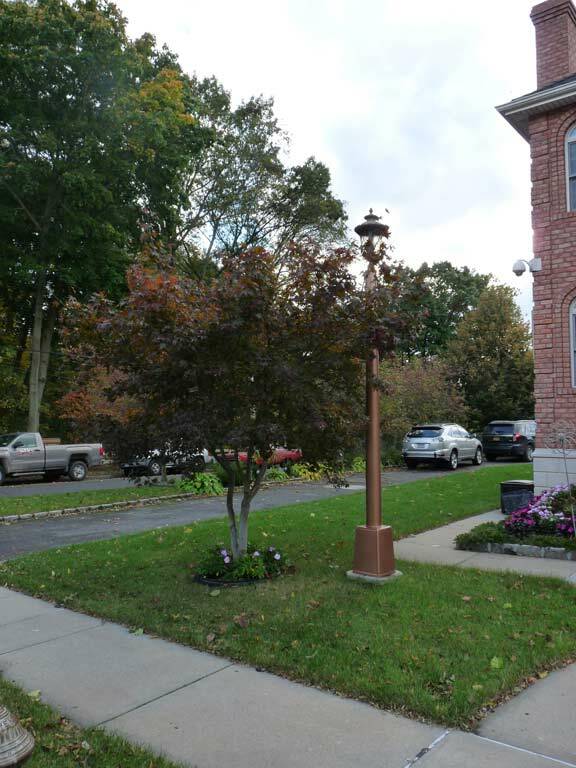 From the beginning Fresh Meadows has had its own set of streetlamps, cylindrical poles that in the 1940s and 50s supported incandescent lights. 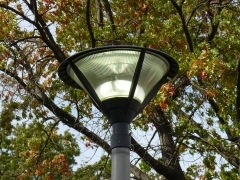 They have recently been fitted with “Conehead” Light-Emitting Diode luminaires, which shine piercingly white. 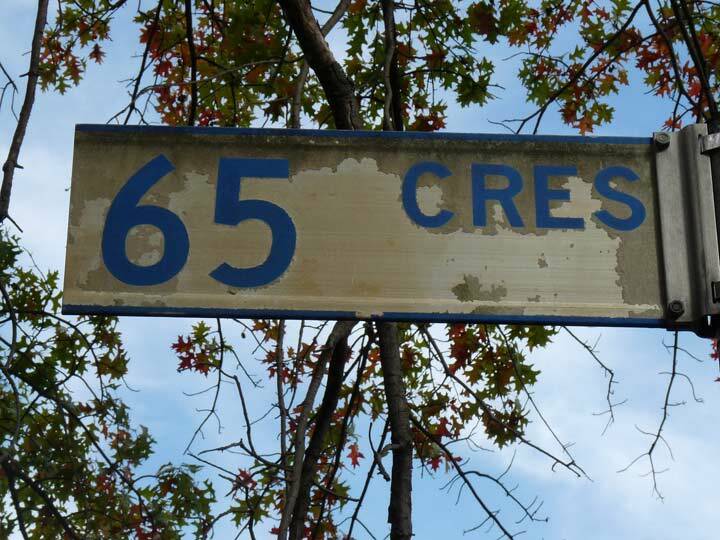 This one at 65th Crescent has a pair of One-Way signs affixed to it. 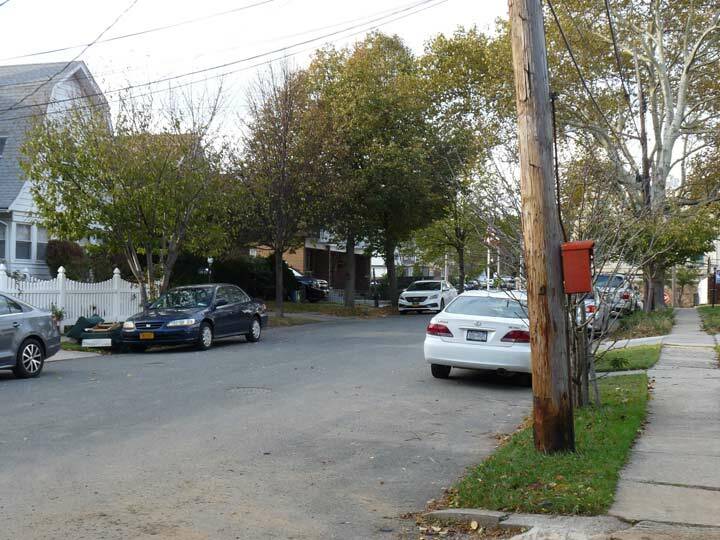 Peck Avenue is among Queens’ most unusual roads, in the humble opinion of your webmaster. 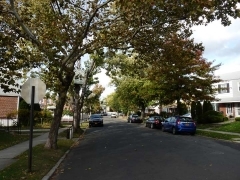 For most of its length, it serves as the south “service road” of the Kissena Park Corridor, which was itself built on the route of the old Stewart Railroad which connected Flushing and Garden City in the 1870s. 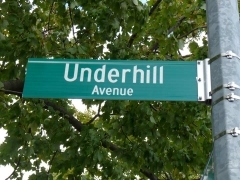 Peck Avenue runs through Flushing, Fresh Meadows, and Hollis Hills in five different sections; in its longest section, it runs south of Corridor Park, while Underhill Avenue runs along the north. 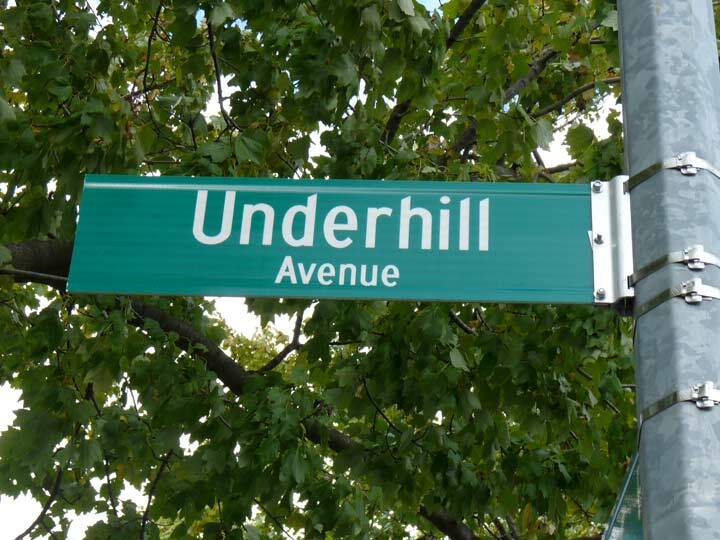 At one time, Peck and Underhill were mapped out to the Nassau County line along the route of the Motor Parkway, but were never built that far. 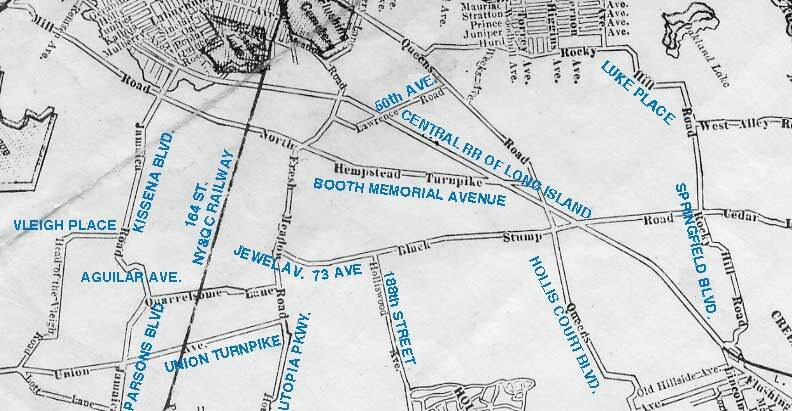 This excerpt from a 1922 Hagstrom Queens map shows the street layout that city planners and developers envisioned at the time, with Kissena Corridor Park extending further east than it does now, with Peck Avenue, indicated in red, following it all the way. The eastern end never came to be, as Cunningham Park and the Clearview Expressway were built instead. 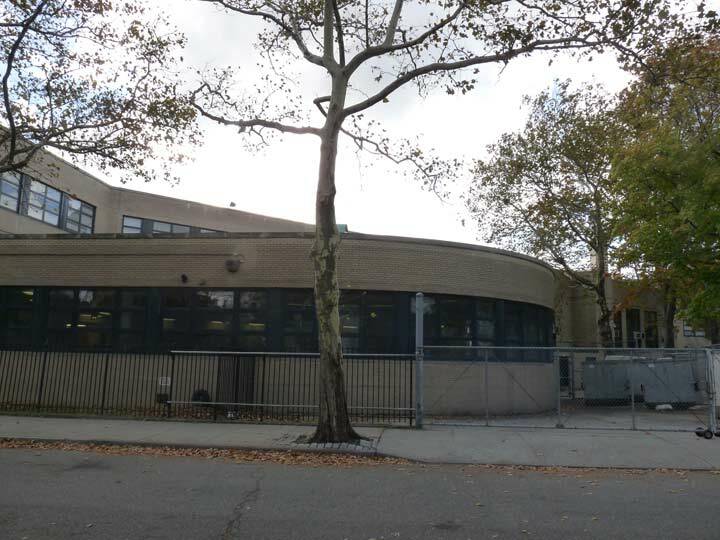 PS 179 on Peck Avenue opened in this location in 1965 and was once known as the Lewis Carroll school, after the author of Alice in Wonderland. As it happens, there’s an online collection of the school’s newsletters in the 1960s, mostly written by the students themselves. When I lived in fab Flushing, the Peck Avenue pedestrian bridge over the LIE (the World’s Longest Parking Lot) was a primary route back home on my many bike rides around Queens. 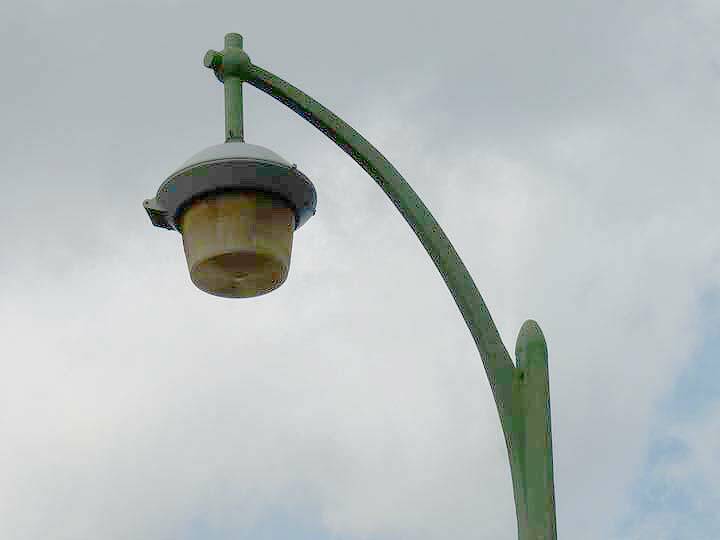 It has its original set of 1950s lampposts, but with yellow sodium “buckets” from the 1980s. Can these poles survive the inevitable transition to LED lamps? 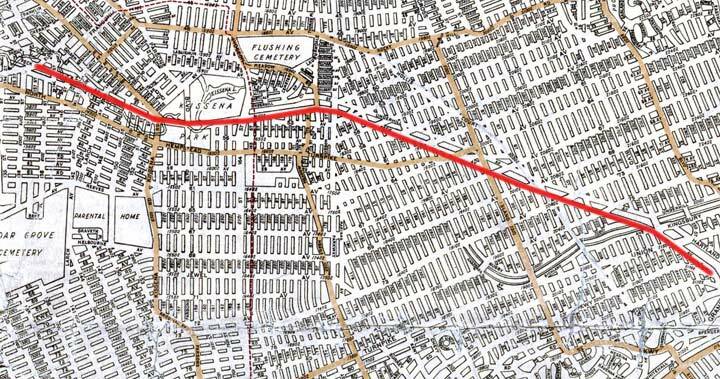 …but as the 1922 Hagstrom map shows, it was originally slated to turn east at one point and become the north service road of the Motor Parkway, which remained open to motor traffic only until 1938, all the way out to the city line, as I’ve shown in red. 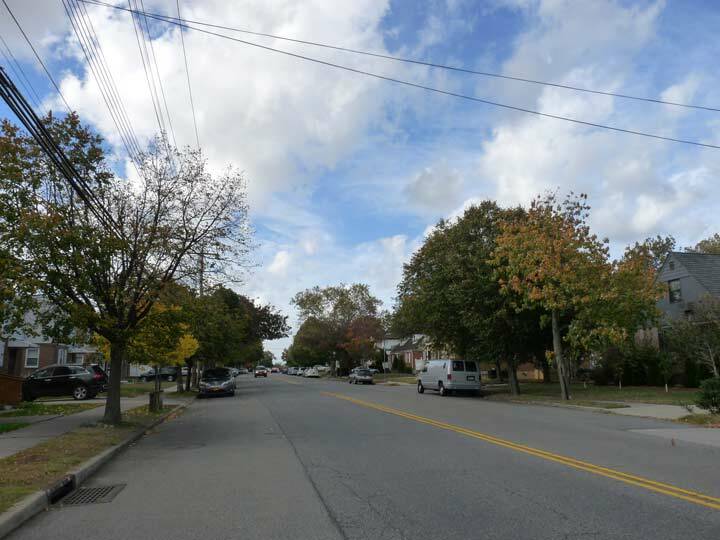 Those plans were scrapped long ago, and today the pedestrian/bike section of the Motor Parkway peters out at Winchester Boulevard. Here’s Hollis Court Boulevard at 195th Place. This wide road cuts diagonally across the grid and it’s not an ancient path, but it did exist as Queens Road in the early part of the 20th Century. 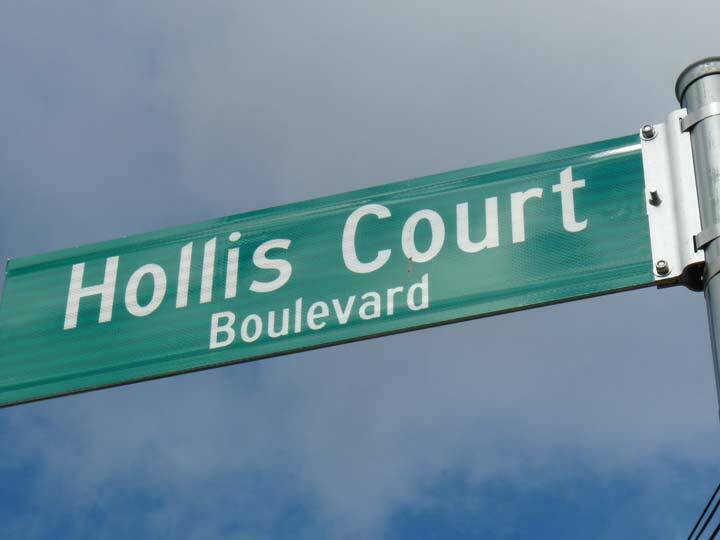 Hollis Court Boulevard originally ran in a straight line between eastern Flushing southeast to Hollis Hills, but the construction of Cunningham Park as well as the Long Island and Clearview Expressways split it into three sections. 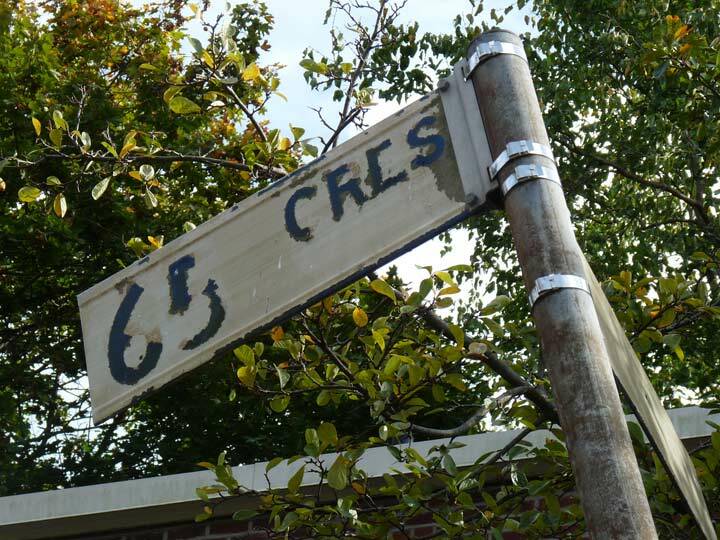 The “Court” was added to the road’s name likely to class it up a bit as new housing was springing up along its route. 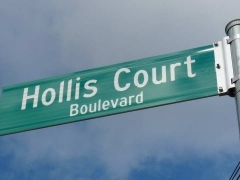 According to the New York Times, the name “Hollis” comes via Frederick W. Dunton, the first developer of the area we call Hollis now, which was once known as East Jamaica. He was a native of Hollis, New Hampshire. 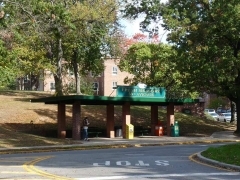 Originally, Hollis, a parallelogram defined by 180th Street, Francis Lewis Boulevard, Hillside Avenue and 104th Avenue and bisected by Jamaica Avenue, was settled by the Dutch and centered around the present intersection of Jamaica Avenue and Hollis Avenue, which was once called Old Country Road. 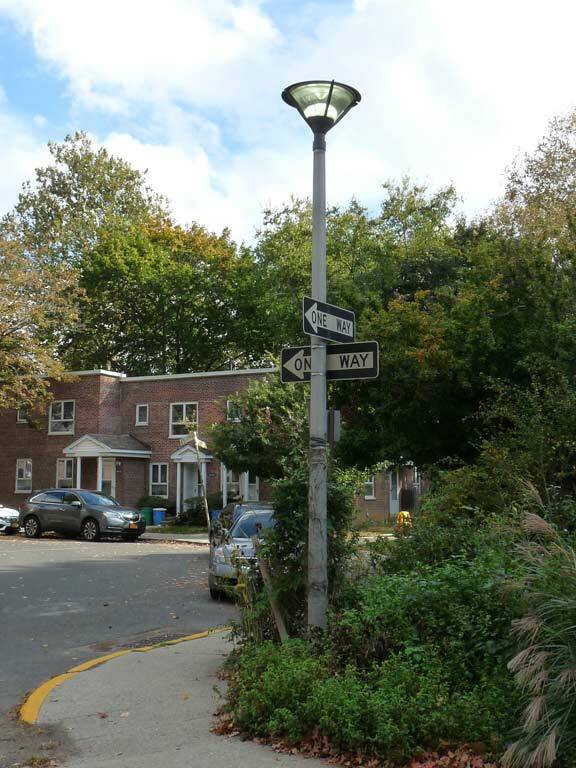 I have some ancient (well, 1930s and 40s) scenes from eastern Queens on this FNY page. Weeks Lane, which runs against the grid northeast from Hollis Court Boulevard to Rocky Hill Road, is one of the oldest roads in the area and turns up on maps from 1852. I found it a convenient shortcut. 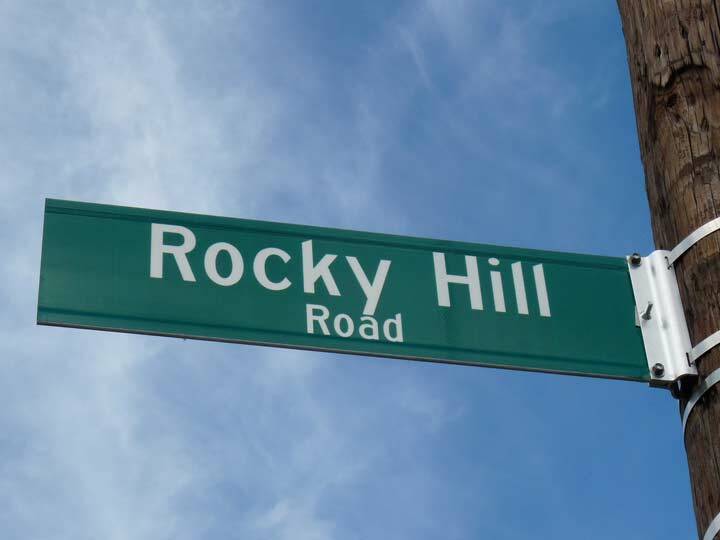 I’ve also written about Rocky Hill Road, a fascinating piece of a much longer road. 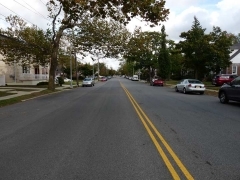 This short section has survived only because it connects 47th and 48th Avenues between Francis Lewis Boulevard and the Clearview Expressway. 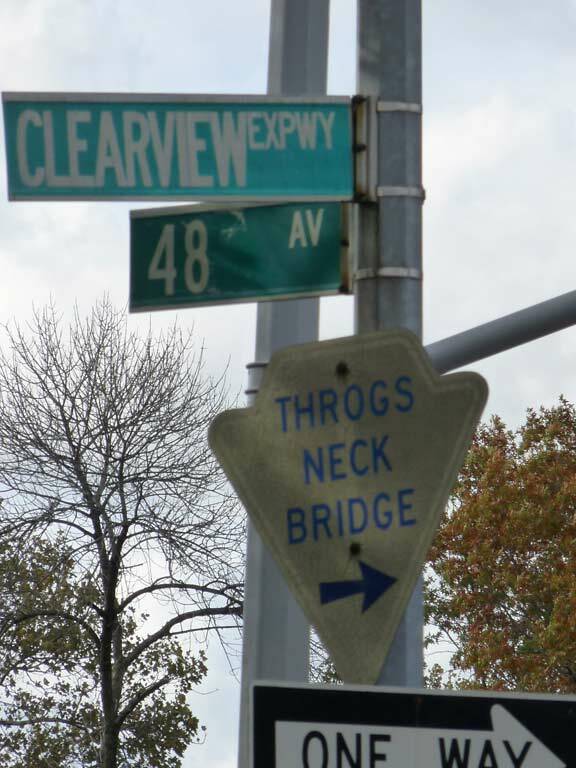 I found an arrowhead sign pointing the way to the Throgs Neck Bridge at the Clearview service road and 48th Avenue. 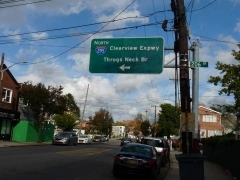 The service road ends its northern progress because of a band in the expressway here at 48th Avenue, so bridge-bound traffic is directed east on 48th and then north on 206th, where it can pick up the expressway past Northern Boulevard. This circumstance leads to one of the few occasions in which you’ll see a massive expressway stanchion located on a “local” street, in this case 48th Avenue and 206th Street. They are truly massive and must be anchored considerably below ground. 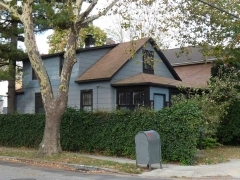 I know very little about Clear Springs, a tiny subneighborhood in Bayside consisting of some older dwellings and the Trinity Baptist Church of Bayside, concentrated on 48th Avenue at about 208th Street. 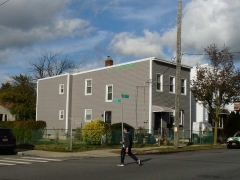 I understand from newspaper clippings (that I no longer have) it is, or had been, a small cluster of African Americans in Bayside. Lifelong Baysider and activist Mandingo Tshaka knows about Clear Springs and over the years I have tried to contact him about it. 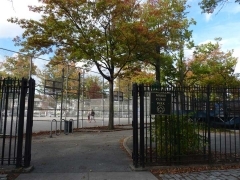 The Marie Curie Middle School (MS 158) and public park are named for Polish-naturalized French physicist Marie Curie (1867-1934), who discovered radioactivity and the chemical elements polonium (named for her original home country) and radium. She won the Nobel Prize in Chemistry with her French husband, Pierre Curie, and on her own in 1911. Her research cost her her life as she died from radiation poisoning at age 66. 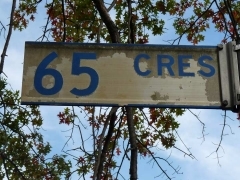 Her life was memorialized in a 1943 film starring Greer Garson and Walter Pidgeon. 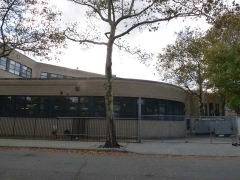 I was struck by the unusual design of the school, which features 3 stories of extra-wide windows and an oval rear. I was unaware of the presence of a public pool in Marie Curie Playground until now! I’m fascinated by this house at 47th Avenue and 210th Street. It seems like it was plopped in from the 19th Century and, since there are some older dwellings and farmhouses around here, it may well have been. 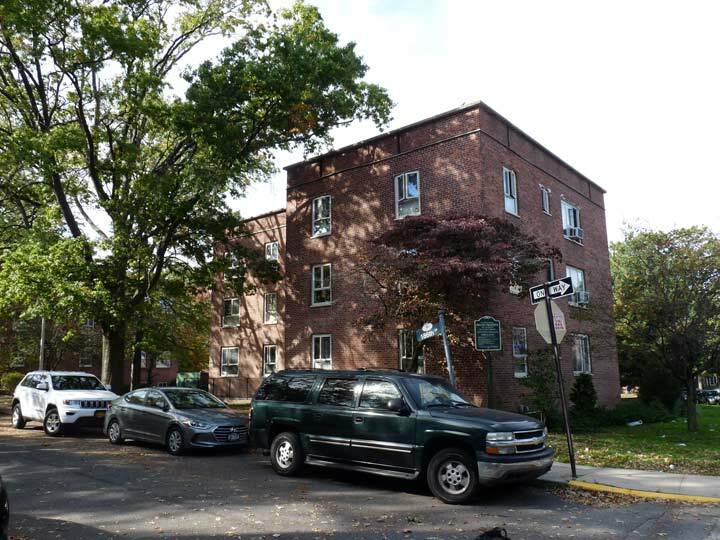 The pine street in the yard adds to its timeless quality. 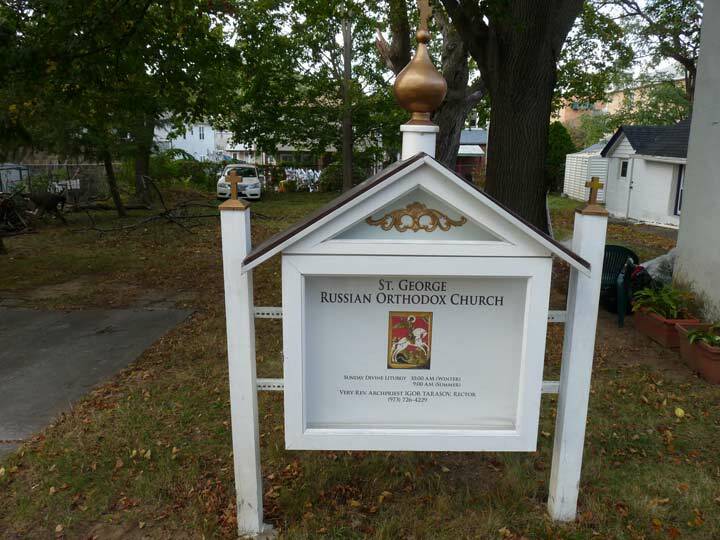 One of the real obscurities of Bayside, and one I’d forgotten about the past few years, is the presence of the St. George Russian Orthodox Church on 46th Avenue just west of Bell Boulevard. 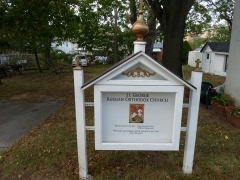 It’s the smallest such church I’ve ever seen, compared to the large, onion domed numbers I’m aware of in Whitestone and Williamsburg, while the only onion dome to be seen here is on the ID sign. The services list is, unusually, posted in English. 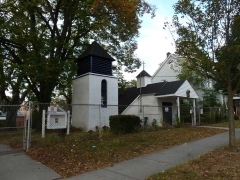 Its website claims the church is over a century old and this may indeed be the original building. 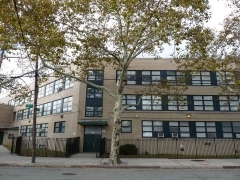 PS 31, on 46th Road just west of Bell Boulevard, is one of the most recognizable buildings in southern Bayside and can be seen from blocks surrounding it. Its tower was repainted in wedding cake white some years ago. 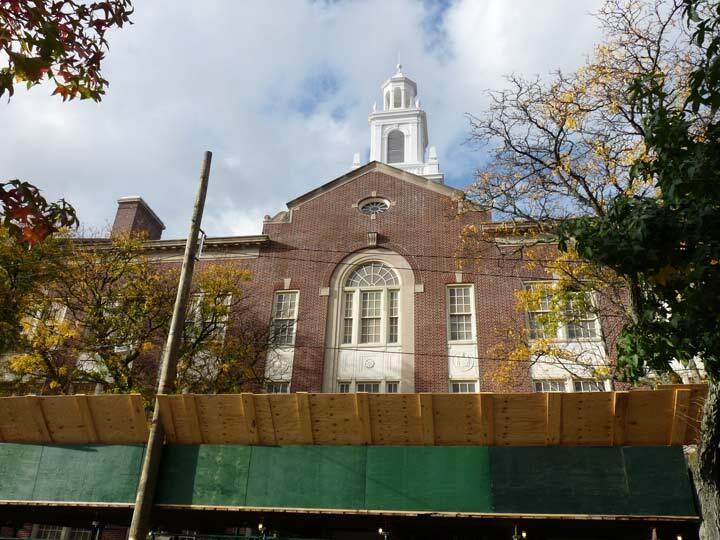 I find it reminiscent of the clock tower at Poly Prep in Bay Ridge, without the clocks. Unfortunately in October 2017 it was surrounded by a semi-permanent sidewalk construction shed. Springfield Boulevard begins modestly at Northern Boulevard and 219th Street and moves generally south and southwest, ending just south of 147th Avenue in Rosedale, adding a couple of lanes when it passes Jamaica Avenue. In Bayside, it traces the route of Rocky Hill Road (linked above), while south of Jamaica Avenue it appears on maps as Springfield Road as early as 1852, and probably originated in the colonial era. 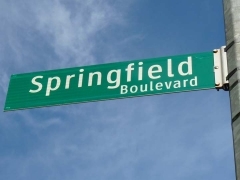 It runs past the old town of Springfield, which was clustered around Springfield Road and the Merrick and Jamaica Plank Road (now Merrick Boulevard). 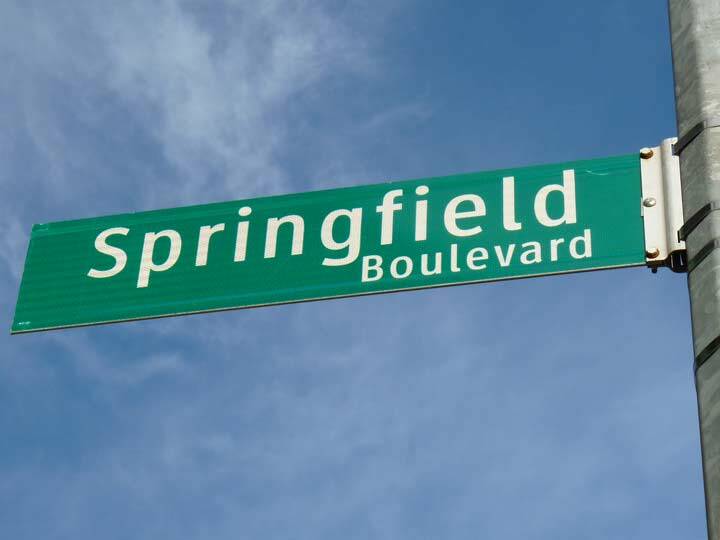 While the name “Springfield” has passed into history, its name survives in nearby Springfield Gardens. 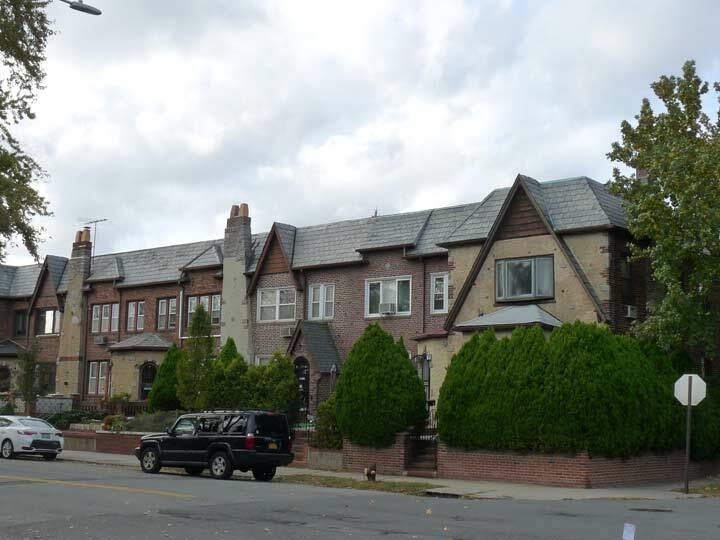 Handsome collection of attached houses on 46th Avenue and 215th Street. 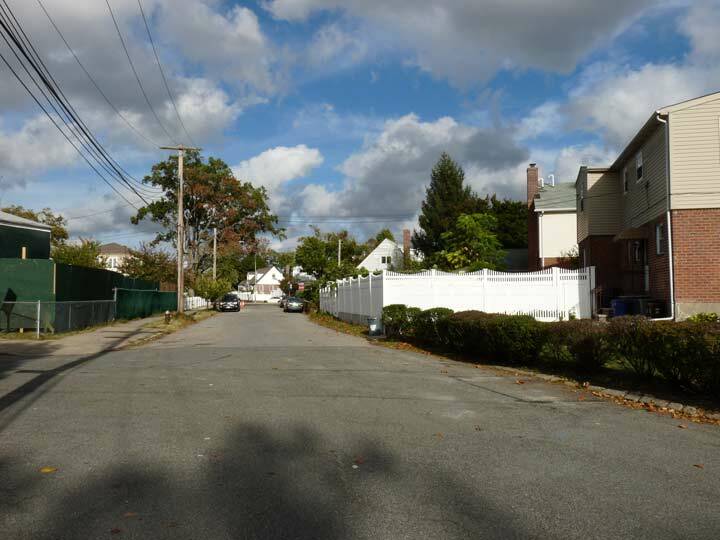 46th Avenue east of Springfield Boulevard skirts the north end of the park surrounding Oakland Lake. 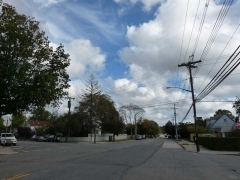 It is the largest of a number of small “kettle ponds” left over from the passage of a glacier that stopped its southern progress in the middle of Long Island 15,000 years ago. According to the NYC Parks Department, it was once thought to be fully 600 feet deep, but the lake bottom was found to be just 20 feet in 1969. 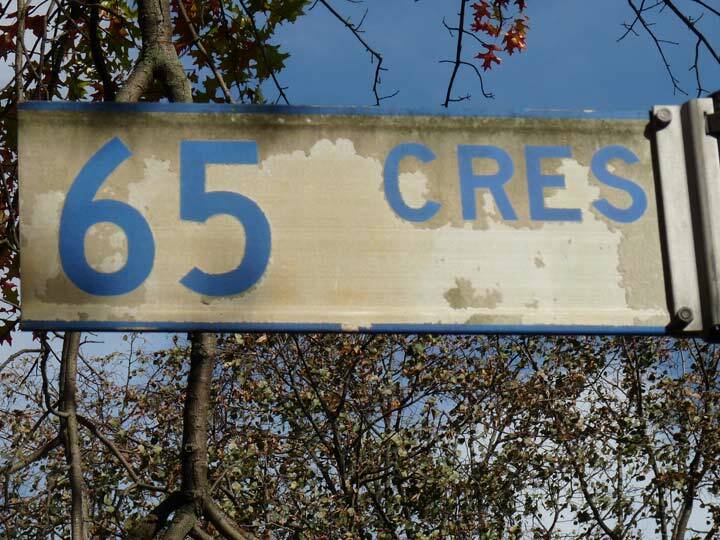 Similar to what was done with Kissena Lake a couple of miles to the west, Oakland Lake was surrounded with a concrete lining and “citified” in the 1930s. 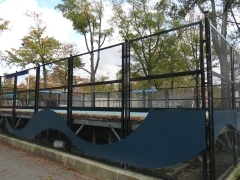 After lean years in which the lake’s condition deteriorated, a revitalization effort was spearheaded by local resident Gertrude Waldeyer, whose Oakland Lake and Ravine Conservation Committee raised $1 million to restore the lake to its natural state. It is now home to catfish, sunfish and carp. Oakland Lake has taken its place, along with other Alley Pond lakes such as Turtle Pond, Decodon Pond, Lily Pad Pond and Muskrat Pond as small glimpses of real wetland in the big city. I found something unusual on the front yard of the corner house at 46th Avenue and 220th Street. 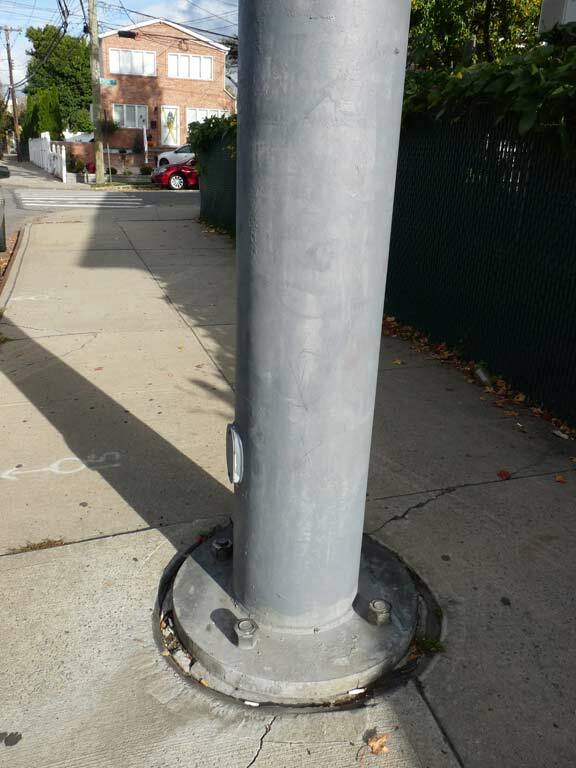 What’s now a decorative lamp has apparently been fashioned from one of those cylindrical poles the Department of Transportation uses to support stoplights and pedestrian crossings. 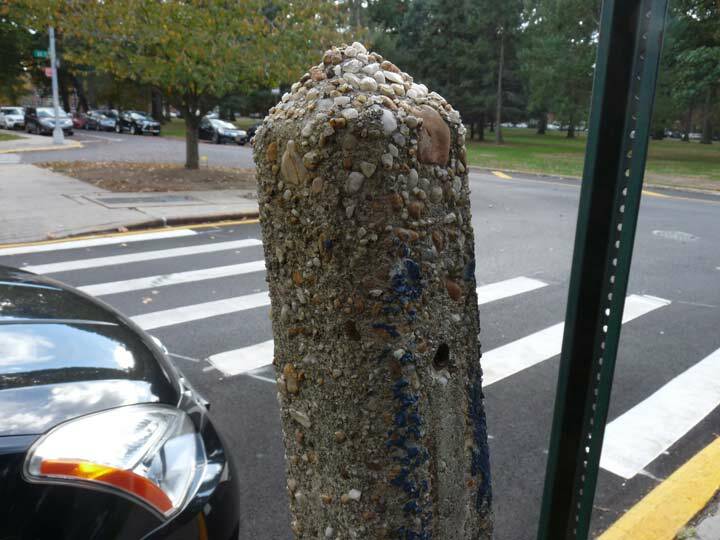 Another anomaly appears on 220th between 46th Avenue and Northern Boulevard. A fire alarm has been placed midblock. 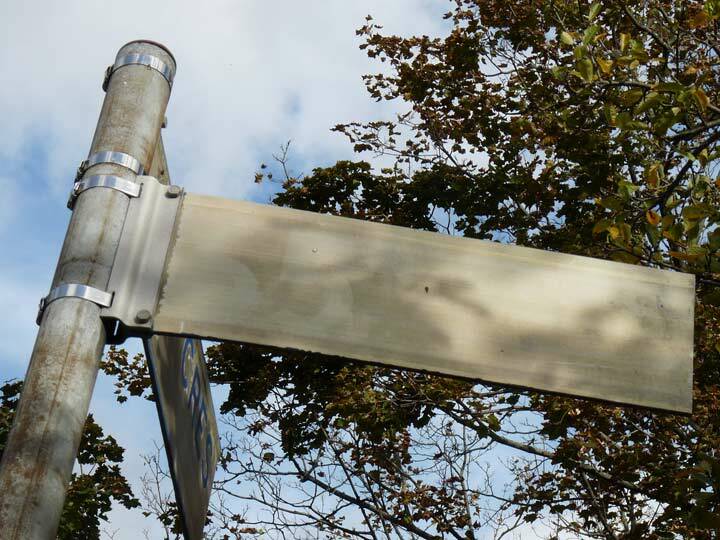 Normally, alarms are placed at street corners. 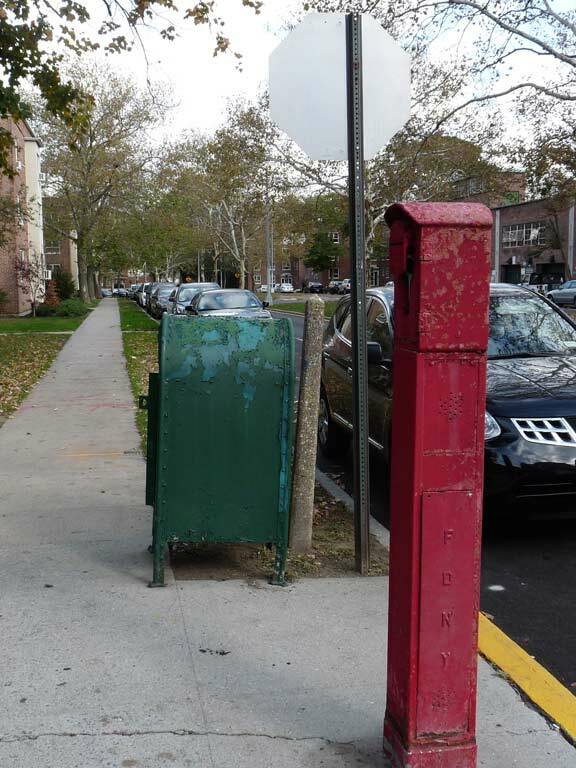 I wonder what circumstance arose that caused the FDNY to place an alarm in such an unusual spot. 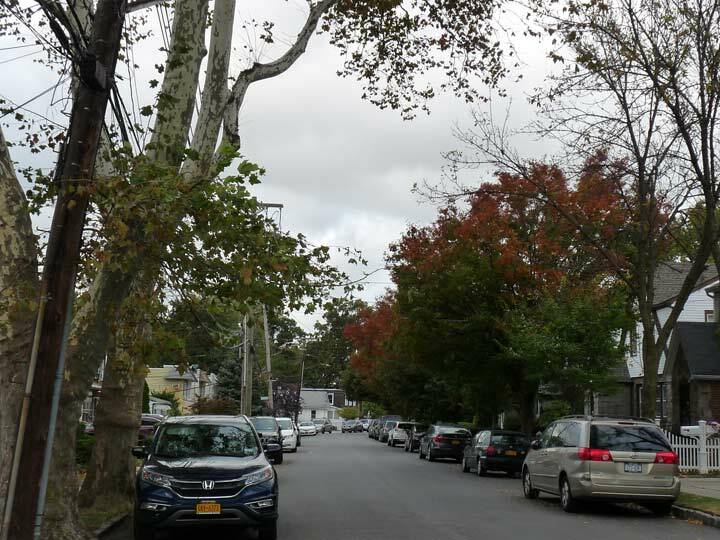 Marathon Parkway is another route that begins as a trickle, at Little Neck Parkway and 42nd Avenue, and gains momentum, traffic, and lanes as it heads south. 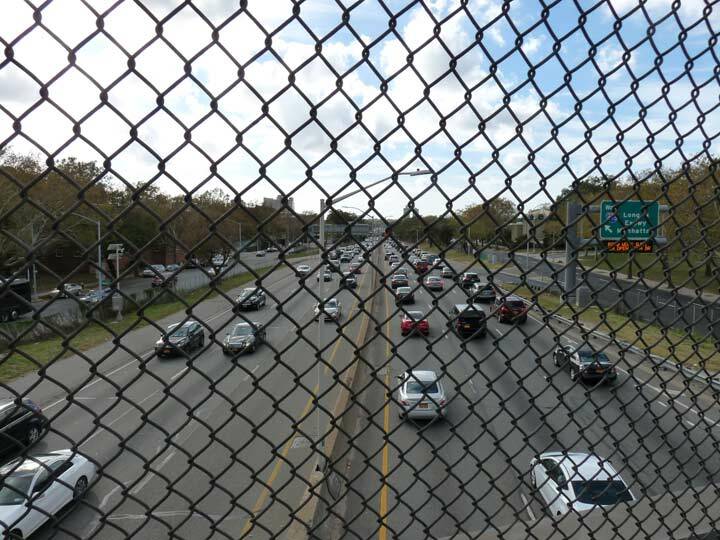 Finally, it transfers its traffic to Commonwealth Boulevard at 64th Avenue and ends at Grand Central Parkway. For many years, this farmhouse, the first address on Marathon Parkway, was decrepit and falling apart. 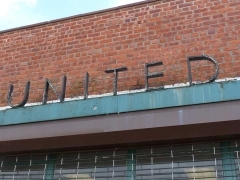 About three years ago it received repairs and a paint job, and today it stands as a reminder of Little Neck’s country past. 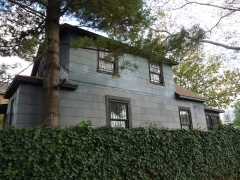 I have gathered that it is one of two area houses owned by Matinecock Indian descendants, and one of these days I hope to speak to one or both of the owners. 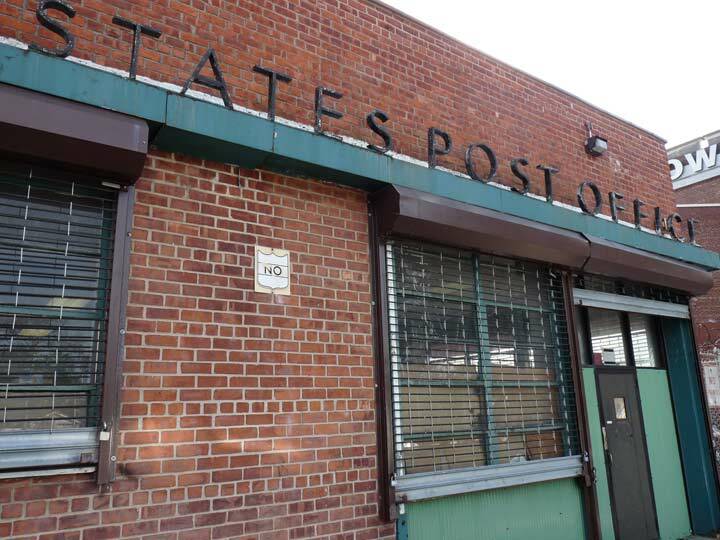 One of the crown jewels of Little Neck Parkway at 42nd Avenue is PS 94. 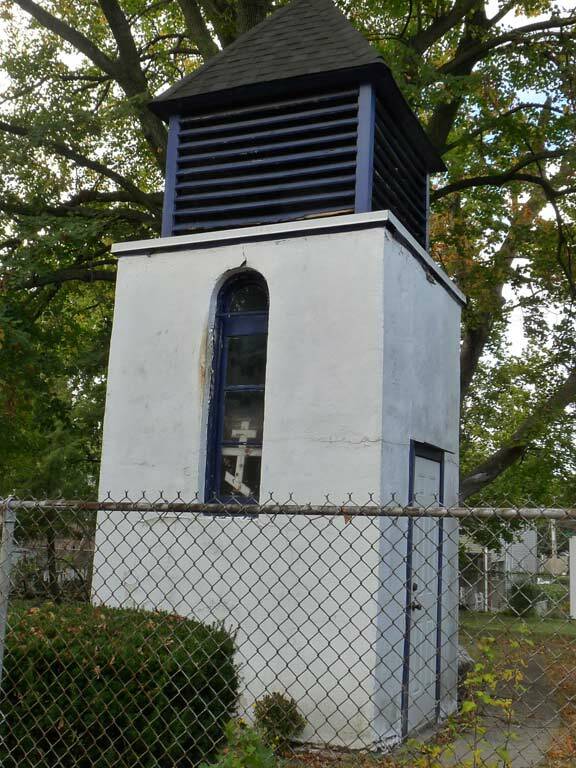 It was constructed from 1913-1914 and replaced a one-room schoolhouse at Little Neck Parkway and Bates Road (originallly Lakeville Road) that has been replaced by a Mormon tabernacle church. 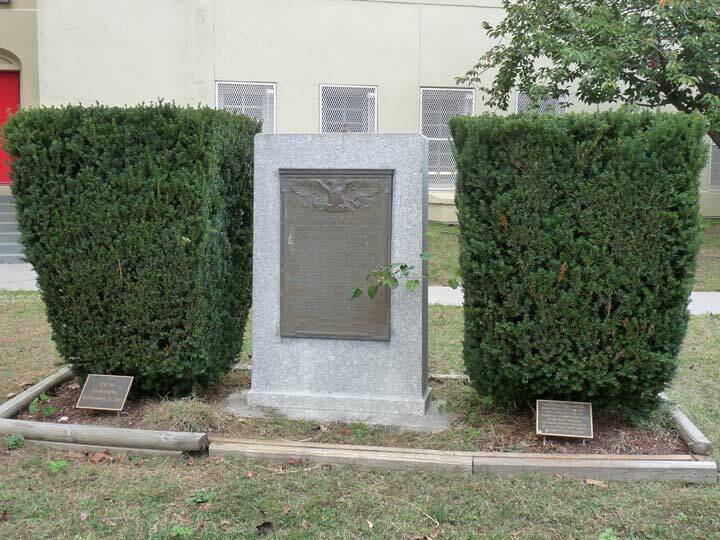 Little Neck’s World War I memorial, honoring area residents killed therein, is on the PS 94 grounds. 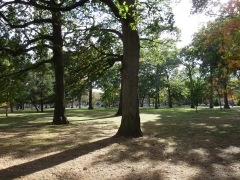 Home again, to Westmoreland Gardens. I can’t show you the interior, but I can show you the original 1941 brochure, from when the apartments were rentals. 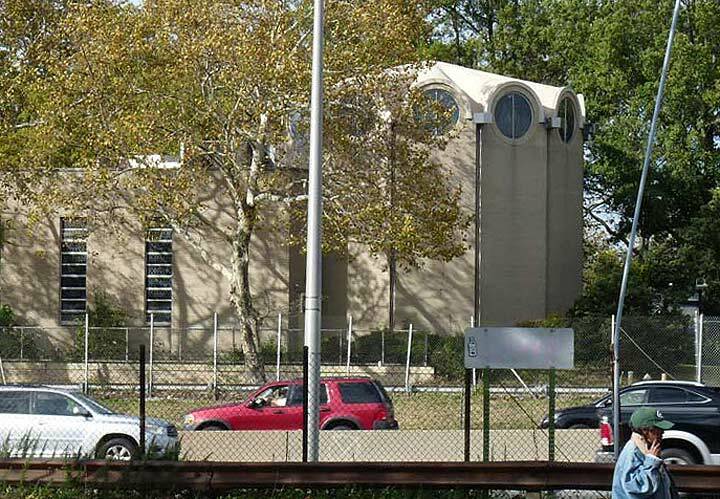 When the Fresh Meadows development was owned by NY Life, it had its own garbage collection, incinerator and distinctive street lights. I believe the city took over the garbage collection and closed the incinerator around 1960 (could be before). 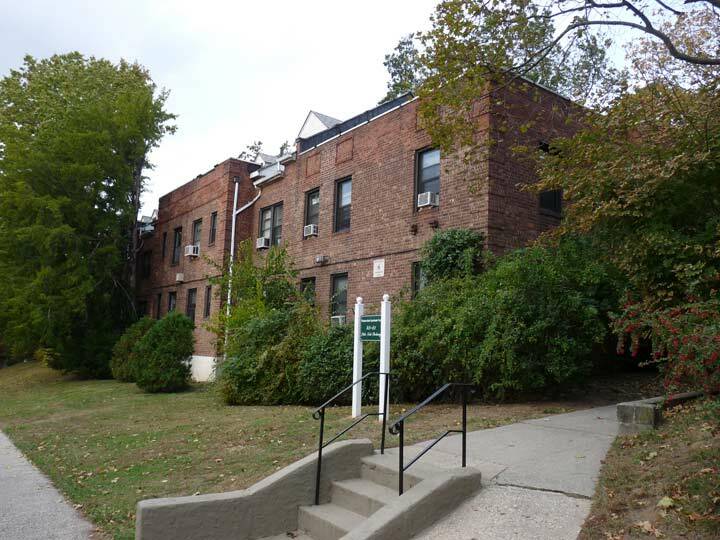 The incinerator was located near where the 6700 building (6700 192nd street) was built. My memory is a little hazy of this, but I believe there were parking garages located in or near some of the 3 story apartments. Some of the garages may have had Mobil gas pumps. The 6700 building was the last building to be erected in the development. At the time it was being built, there was a rumor that the some of the NY Mets were going to live there. 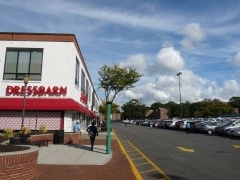 The Fresh Meadows shopping center used to have a Horn and Hardart restaurant, a Bloomingdales Department store and a movie theatre (Century Meadows). 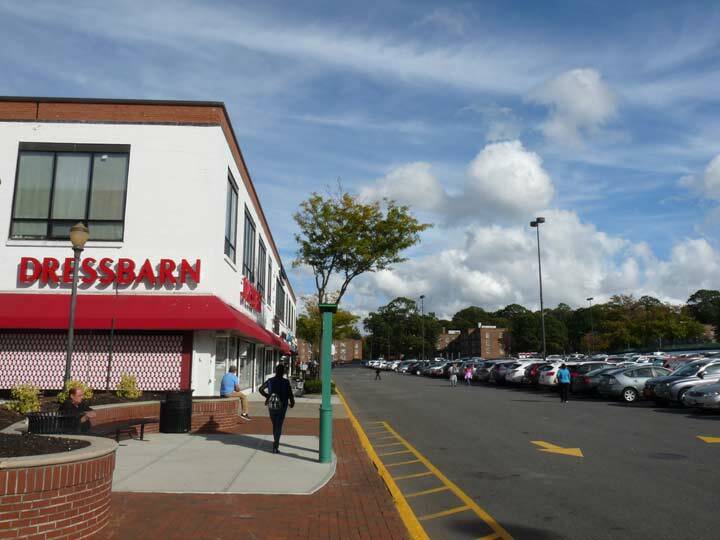 Located on 188th street were a Horn and Hardart retail store, an Ebbinger’s bakery and a Rexall drug store. All gone now. It’s actually a Mormon church on Little Neck Parkway, not a tabernacle. Mormon tabernacles are basically conference and meeting centers. There aren’t that many, mostly in and near Utah, with the one in Salt Lake City being the most famous. Mormons have ordinary churches (formally called “meetinghouses”), which hold regular services. They also have a smaller number of much more ornate temples, which are used for various ceremonies including marriages. 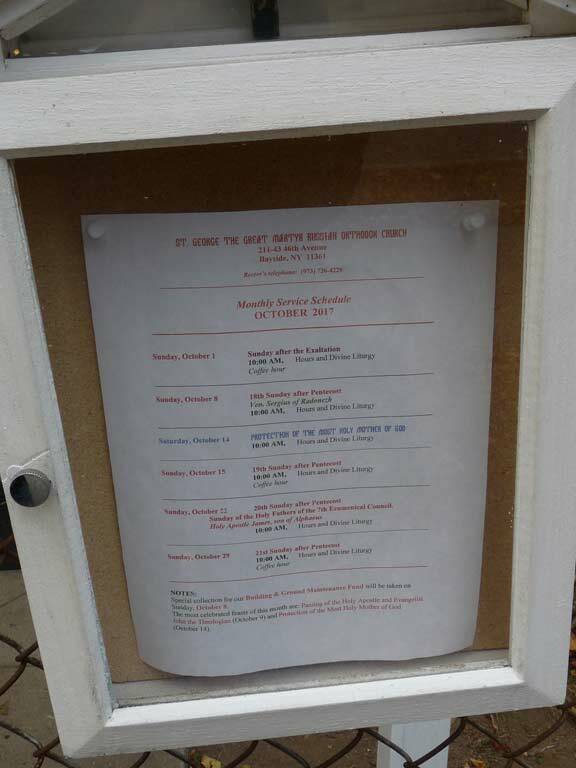 While anyone can attend a church/meetinghouse service, temples are open only to practicing Mormons in good standing with the church …. which means, among other things, that they have made sufficient financial contributions. You’ll also find Mormon temples in AZ (Mesa, Chandler, & Gilbert). San Tan Valley, where I live, must have elevated it’s status among Mormon because a temple is under construction here. BTW: they call themselves The Church of Latter Day Saints (LDS). 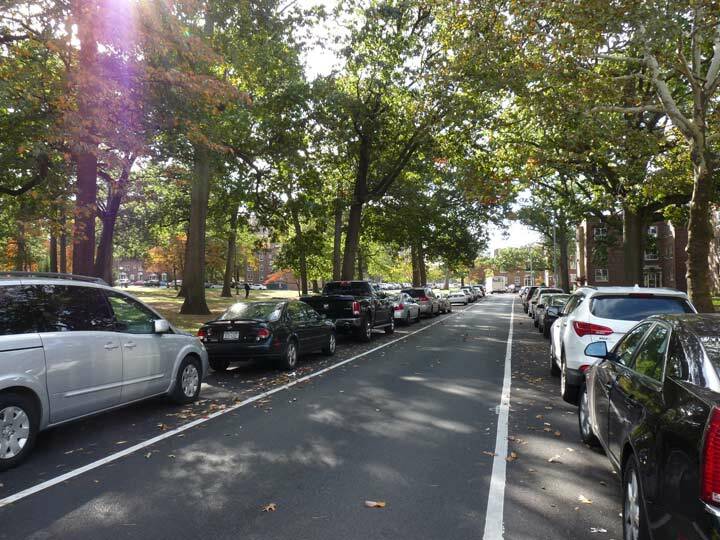 If you see pairs of young males on bicycles wearing dark blue slacks & white shirts, don’t make eye contact otherwise you’ll be asked if you’d like “help” or if you’d like to chat. In a parking lot you can tell an LDS owned vehicle: it’s a minivan or crossover with a family sticker (one character for every member including the pets; usually there are several children). This concludes my lecture about East Valley sociology. Thanks again, Kevin, for another great multi-part FNY tour. 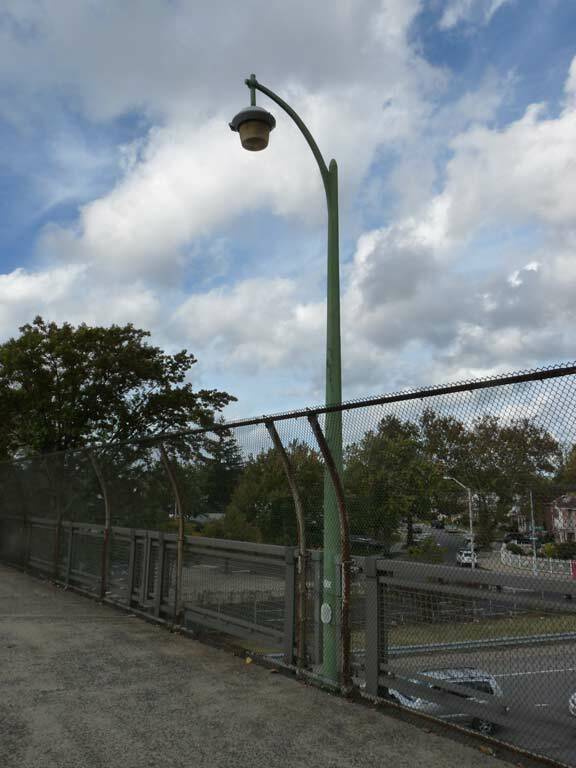 One wonders if every generation of NYC street lights must be brighter than the one it follows. Pretty soon, no New Yorker will ever be able to see the stars. Some cities in the Southwest go out of their way to block lights that interfere excessively with star-gazing. 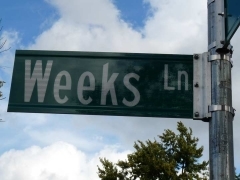 One wishes Our Town could do the same, at least in a few locations here and there. 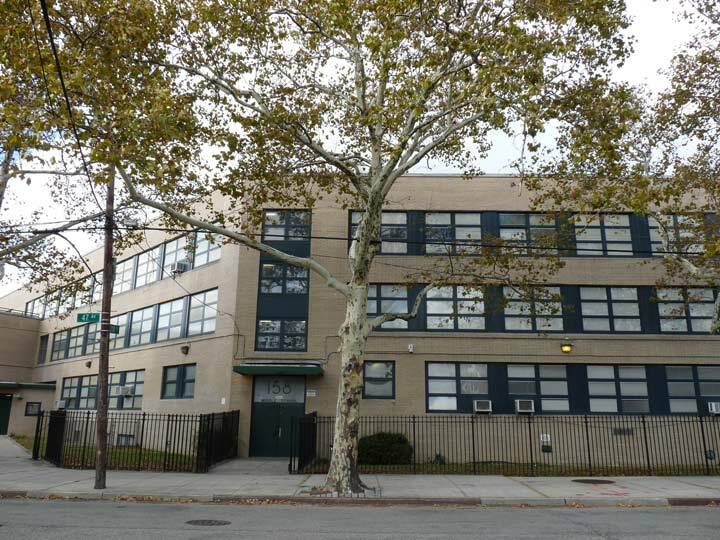 Willie Mays used to live at 6700 192nd St. (referred to by locals as “the 20-story building”) after he became a Met at the end of his career. I saw him driving his Caddy with “Say Hey” plates more than once. The “green” is known to Fresh Meadows residents as “Oak Grove.” From 1967-1971 I took the Q31 bus to high school, passing Clear Springs (never knew it had a name) on 48th Avenue every day. It was an African American neighborhood, and was not kept in good repair. 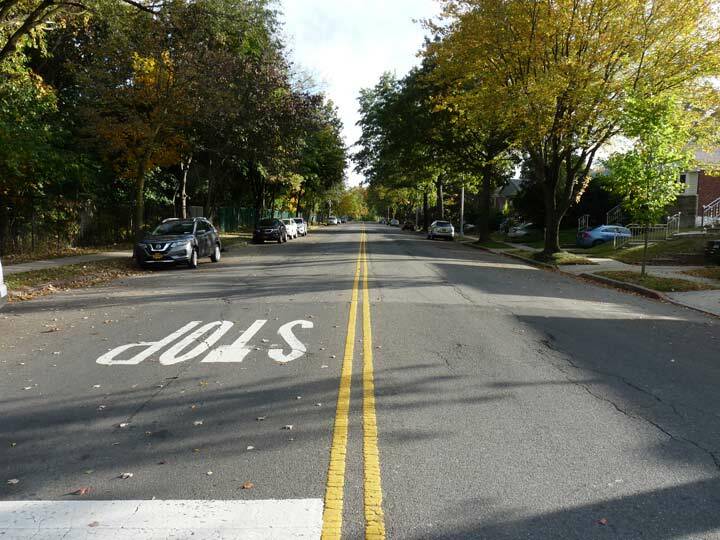 Some streets were not paved – as I recall it was 207th and/or 208th, north of 48th Ave. Very stark contrast to the surrounding areas. 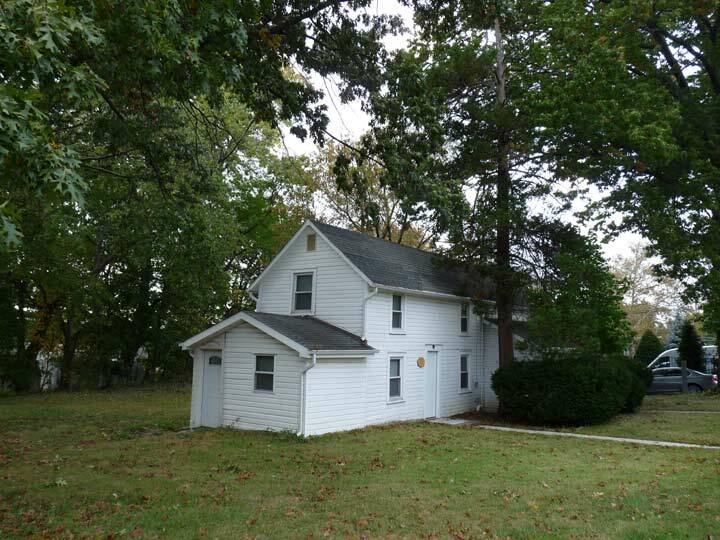 That farmhouse was actually built in 1930, but it really does look like a time machine placed it there…. 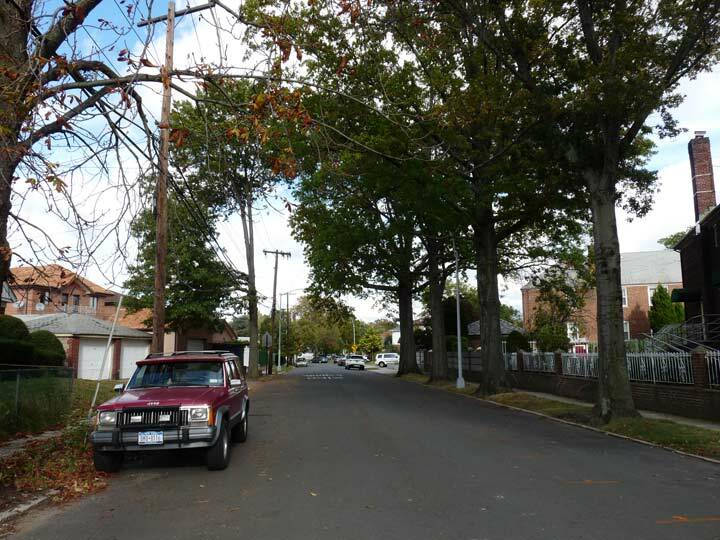 Delightful to learn that 73rd Ave., which was my cross street when we lived on 199th Street from 1971-75, used to be “Black Stump Road”! 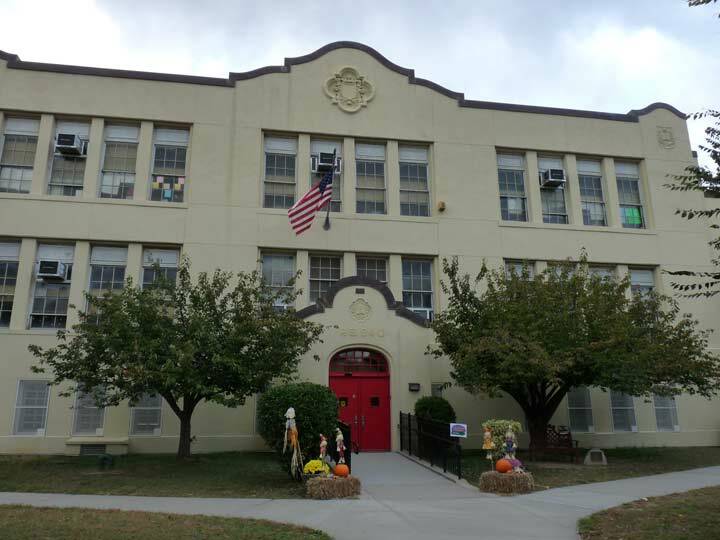 PS 179 was built in 1955, not ‘65. 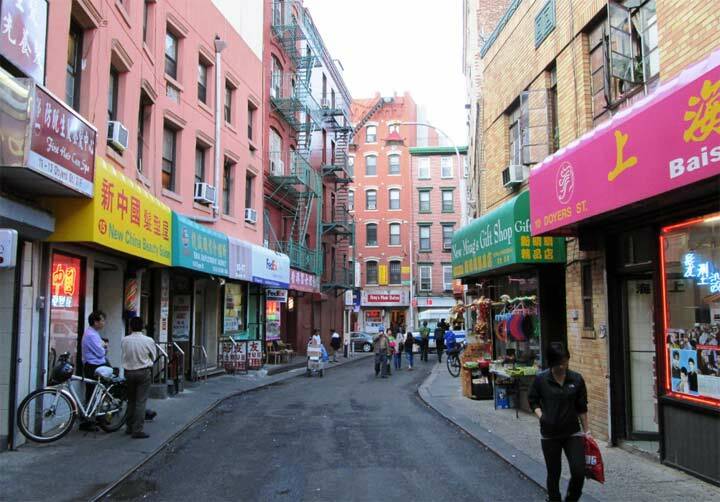 I worked at a Buy Rite liquor store in the early 80’s on Horace Harding and part of my job was deliveries within the NY Life apartments. 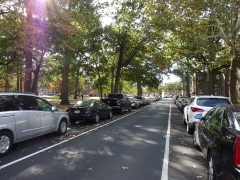 Armed with only a 1972 Dodge Dart and verbal instructions (there were no Google maps back then), I had to navigate the maze to make my deliveries. To this day, it is almost impossible for me to get lost. Fresh Meadows was purposely built without through streets to avoid heavy traffic. 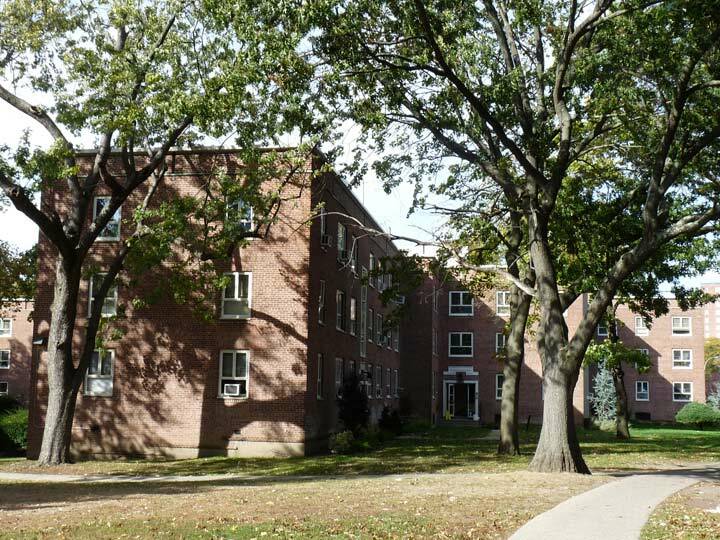 When constructed, FM was, at the time,was considered one of the ten best planned communities in the country. 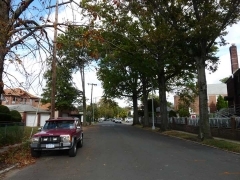 Those “haphazard’ streets were nothing of the kind, built to retain a country feel which continues to this day.I grew up on 73rd ave and 192st and my fondest memories of the 50’s and 60’s were riding all over FM. T library got a facelift from the days I frequented it. You left out Bishop Reilly/St. Francis HS on Francis Lewis/ Horace Harding, built in the 60’s. It changed names in the 70’s I believe.